Our 2019 Camps are filling up fast! Looking for a specific date? See the week-by-week schedule. Don’t miss our Early Bird and Multi-Camp discounts and our scholarships. 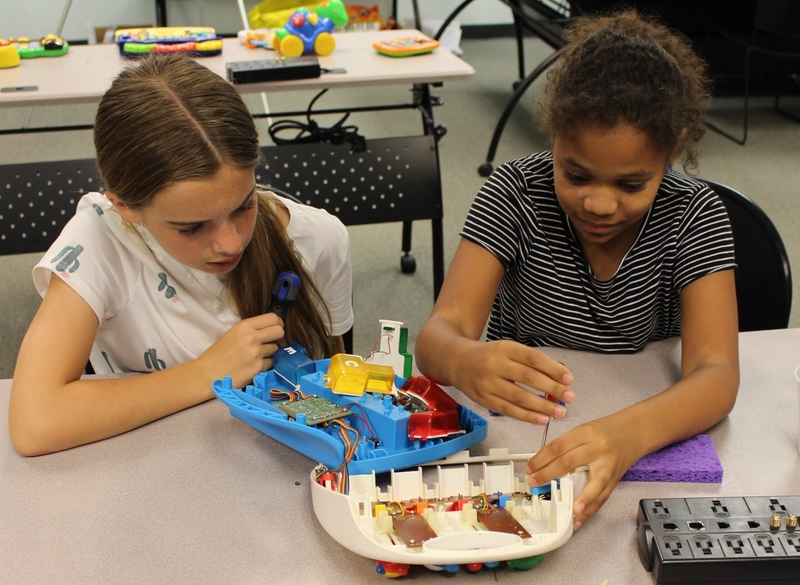 Extended camp for middle schoolers: Learn how to build a computer from scratch, including: choosing parts, installing parts into the case, adding a graphics card, troubleshooting, loading software, testing and benchmarking. Get hands-on experience as you build, modify, and tear down computers, including a start-to-finish gaming PC practice build. $20 Discount for Wake Students! Use code WAKESPRING for $20 off Build a PC Camp. Offered through Cary Parks & Recreation. Prepare for the future of flight! Drones are everywhere, and they’re more than just toys. Trained pilots and engineers will be in high demand, so practice your piloting skills and learn to fly safely and precisely. Try simulators and remote-video quadcopters and complete challenging missions. Sorry, discounts and scholarships are not available for this camp. Plan your summer now and don’t miss out. For 5-day camps only. Ends April 1. Multi-camp and Sibling Discounts: Save 10% on two or more camp registrations. Call 919-293-1133 or email camps@kramden.org to get your discount code. Dive into electronics with a week of circuit building projects. Learn how circuits work by taking apart gadgets, prototyping with kits, and safely experimenting with components. Build circuits with LED lights, speakers, motors, and microchips. A great foundation if you want to get into electrical engineering or robotics. Take home your own kit of parts with project guides, plus a complete soldered project. This camp is full. Join the waitlist to be notified if space opens. Create your own fun games while learning about coding and game design. You’ll learn the skills you need to start developing games. Plan out your game’s setting, develop gameplay mechanics, customize the code, and add graphics and sound. No coding experience required. You’ll take home your finished PC game to play and share, along with its source code so you can keep working on it using GameMaker Studio. A fun introduction to comic book storytelling for campers in elementary school (grades 3-5). Learn from a professional comic book artist as campers create their stories, dialogue, and art. Then learn how to arrange the pieces of your comic to show action and emotion. Use cool comics software to make your stories look amazing. Not great at drawing? We’ll help you use photos and other art to tell your story! Get creative with fun projects using photo, sound, and video editing software. Daily projects include creating a design based on a photo, combining sound effects to tell a story, and recording a video with special effects. Perfect for aspiring artists, musicians, game designers, and filmmakers. Learn how to build a computer from scratch, including: choosing parts, installing parts into the case, adding a graphics card, troubleshooting, loading software, testing and benchmarking. Get hands-on experience as you build, modify, and tear down computers, including a start-to-finish gaming PC practice build. Register through Cary EZ-Reg. See site for details. Both Drone camps are now full. We’ve partnered with the City of Raleigh and Town of Cary for these great camp experiences. Check their sites for camp details and costs. Apply for a scholarship online. Awards are based on financial need and cover up to 80% of the camp fee. Haga clic aquí para solicitar una beca en español. Kramden Institute’s mission as a non-profit includes increasing access to technology education to youth in North Carolina. Your camp fees and other support enable us to offer scholarships for every program we offer. Please carefully read the policies and information below before you register. Early Registration Discounts: Save $20 on spring or summer five-day camps with codes EARLYSPRING2019 (ends March 1) and EARLYSUMMER2019 (ends April 1). Discounts cannot be used for camps offered through the City of Raleigh or Town of Cary Parks and Recreation departments. Only one discount code or scholarship may be used for each camp registration. This includes early registration and multi-camp discounts. Codes cannot be combined. Refunds are available until two weeks before the camp start date. Campers need to bring their own lunches. We’ll provide snacks and water. If your camper has food allergies or restrictions, be sure to list them when you register. Make sure your child is aware of their allergies and what foods or ingredients to avoid. We will have peanut-, tree nut- and gluten-free snacks available. Camps are from 9 am to 4 pm each day. You can drop off as early as 8:30 am, and pick up no later than 4:30 pm. If your child has to miss a day of camp, please let us know as soon as you can. If you need to contact your child or the instructors during the day, call 919-293-1133. When you drop off your camper in the morning, please come in to the office to check in. Please also come inside to check out your camper at the end of the day when picking up. Only authorized adults will be allowed to pick up a camper. If you need to add another authorized adult after registration, email their full name and relationship to the camper to classes@kramden.org. This must be done before the pickup time. This includes any other parent/guardian or any relative if they were not listed during registration. We may check IDs at pickup to ensure your camper’s safety. If your child has any daily or emergency medication or device, such as an EpiPen, please make sure they bring it. Let the instructors know they have it when you check in. All medication must be brought in the original bottle and campers will only be allowed to use it as directed on the bottle unless accompanied by a doctor’s note. No medications other than those listed on your camper’s registration or those you inform us about in advance will be allowed. If your student may have trouble using their medication as directed, please let the instructors know. If you have information about your child’s special needs that will help us make sure they a great time at camp, please contact us before camp begins. Our camps include break times and activities when campers will be outdoors (weather permitting). Make sure your child brings appropriate clothing and supplies (jacket, sunscreen, water bottle, etc). If there are restrictions on your child’s physical activity, please let us know in advance. Campers are expected to treat the instructors and other campers with respect at all times. If a camper is disruptive, instructors may intervene to help the camper improve their behavior. Continued disruptive behavior may result in temporary or permanent dismissal from camp. Physical aggression or threatening behavior will result in immediate, permanent dismissal from camp. Campers are permitted to bring their devices to camp, but may only use them when allowed by the instructors. If device use interferes with camp activities, the instructors may take possession of the device until the end of the day. Camps are held at our office in Durham near RTP unless otherwise noted. Some camps are located in Raleigh and Cary. Email camps@kramden.org or call 919-293-1133.